Job Aspirants who got a New Job in UAE have to produce Police Clearance Certificate (PCC) / Good Conduct Certificate for applying Employment Visa in UAE. Police Clearance Certificate is a mandatory requirement in UAE for issuing Employment Visa in UAE. How to Apply for Police Clearance Certificate for UAE? Application for Police Clearance should be submitted in the nearest Police Station of the Applicant by the applicant himself. Download the PCC Application form and Fill it and apply with 2 Passport size Photo, Passport copy, Aadhaar copy etc. Rs. 1000 have to be paid as application fees. Once the Police Clearance Certificate is issued it should be attested by the Notary before submitting for attestation in state home department which is situated in the state capital. Application to be submitted with Rs 10 court fee stamp affixed on it along with PCC and Passport copy to be submitted in the state home department situated in the South block of Secretariat or at Chief Minister's Complaints Cell near secretariat north block. Application will be collected till 1 PM and the attested PCC will be distributed after 4 PM same day. Once the PCC is attested by the state home department it should be attested by Ministry of External Affairs. Some Private agencies were appointed for the same. state home department attested PCC and Passport copy to be handed over to the agency. Different agencies charge different amount for the attestation. It will take around 4 to 6 working days to get the PCC attested by MEA. Once the PCC is attested by MEA it should be stamped by UAE Embassy. For UAE Embassy Stamping AED 160 (Around Rs. 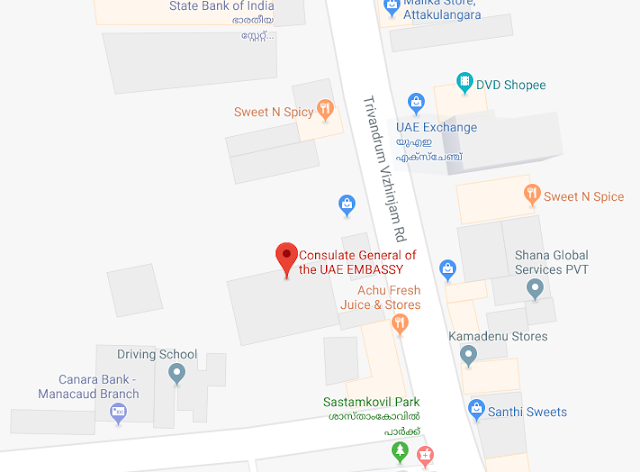 2900) have to remitted in UAE Embassy. For Remitting the Fees you should have International Debit Card. If you do not have International Debit Card you have to buy an International Card by paying Rs 3300 from UAE Embassy. There will be a queue for the same. If you have International Debit Card you can avoid the Queue. Applicant have to go himself to the UAE Embassy along with his original passport for UAE Embassy Stamping. For more questions give comments.